Fridges today often come with popular extras and require more from you in terms of installation. The most popular of these extras is the in-door icemaker/water dispenser unit. For this feature, you need to prepare a water supply line to the back of the fridge. Fortunately, it's not that difficult to do this job. Keep in mind - we do not haul away! Refrigerator installation – new service which will make your life easier! Refrigerators are transported in a horizontal position; it is a prerequisite for the preservation of the set of functions of the device. Our company provides quality refrigerator installation. Specialists with many years of experience will prepare your refrigerator for long period of exploitation. The installation process is regulated, and all the steps are realized according to instructions from the manufacturer. We install a refrigerator following some rules. Firstly our specialists choose the location, in almost cases customers prefer to set up this device in kitchen, but sometimes people have different point of view on this question. Without refrigerators, it’s hard for us to imagine modern life. With it we save food from spoiling, and quench your thirst in a hot summer day. 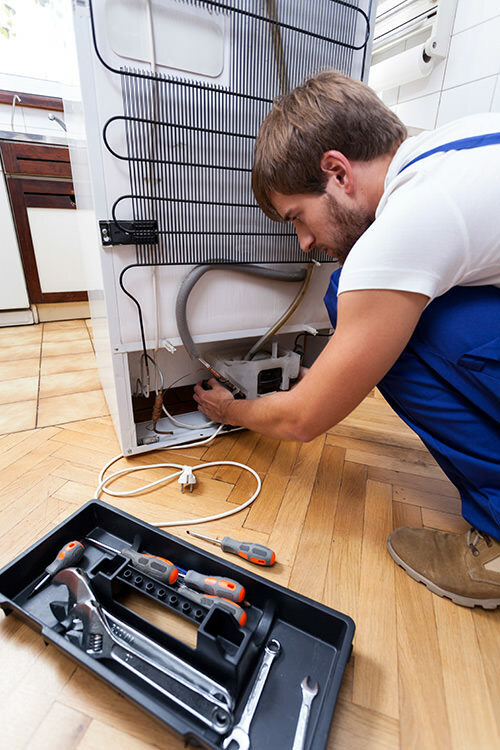 Technicians from Sunny Appliance Repair are happy to offer their services to everyone on the implementation and installing refrigerator at a very reasonable price. Be sure that you will not find better masters than our ones. Realizing the installation process we follow the main rules and nuances. Our technicians take care that the refrigerator should be installed in a dry place, away from heat sources. One more moment is before connecting we need to check the voltage. It is advisable to install a new refrigerator by a trained professional. Only such person is able to notice deviations in the voltage and other features that require the attention. Refrigerator installation cost is available for customers and experienced craftsmen will consult and adjust the operation of the refrigeration system. The company carries out the installation in the terms stated by the customer, ensures the provision of quality services.